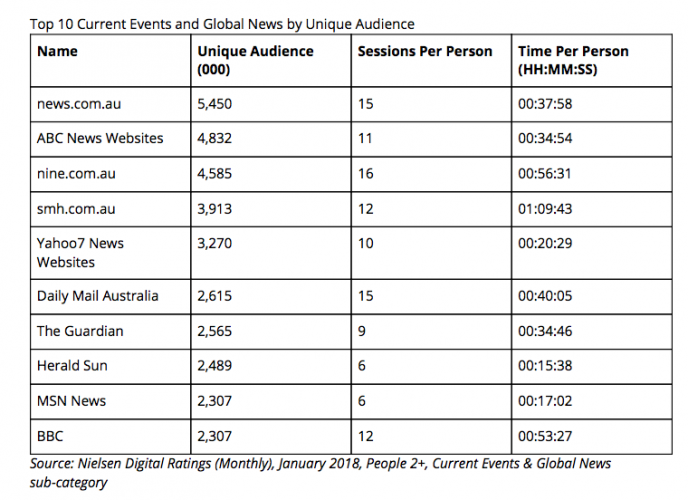 Nielsen digital news rankings for January 2018 revealed that news.com.au (5.4 million) remained the top news entity and grew 2 per cent when compared with the prior year. In second place was ABC News Websites (4.8 million, up 11 per cent ), who moved up from third place when compared to January 2017, switching places with nine.com.au (4.6 million, up 4 per cent) who secured the third spot. Smh.com.au (3.9 million, down three per cent) remained in fourth place. In comparison with January 2017, there were changes in the ranking order for the next six news entity rankings. Yahoo7 News Websites (3.3 million, +25 per cent) moved from seventh to fifth place, followed by Daily Mail (2.6 million, -17 per cent), which dropped from fifth place to sixth place. The Guardian (2.6 million, -5 per cent) which had previously held sixth place in January 2017, moved back to seventh place. Next was Herald Sun (2.5 million, +8 per cent) which jumped up from ninth to eighth. Ninth and tenth place were tied by MSN News (2.3 million, +6 per cent), which has previously held eleventh place and BBC (2.3 million, -4 per cent), which had previous held eighth place.